Mr Bates (Music) – Year 8 students were busy practicing a scene from a common nursery rhyme. Students were challenged to think about their placing on the stage using technical language and in small groups were developing a scene. After a period of practice (during which Mr Bates gave students feedback and further challenge) students were then asked to perform their scene. This is something students often find difficult or are reluctant to do but Mr Bates had built a safe environment in which students could perform. Strict rules were enforced so that the audience respected the performers. Mr Bates questioned the audience following the performance to elicit feedback to the performers based on the success criteria discussed earlier in the lesson. The questions often probed deeper and challenged students to elaborate on their answers giving reasons. Mrs Horrill (Business) – Year 10 students were working on a piece of coursework as a result of a series of lessons leading up to some extended writing. Students were able to work independently and made good use of the course textbook. Students worked in silence which in this particular situation appeared to enable students to work to depth. If they needed help they were able to consult the textbook first before asking the teacher. Whilst this was going on Mrs Horrill was giving 1-to-1 verbal feedback to each student to ensure they understood how to improve. The set up for this lesson showed clear planning that focused on students practicing the skills and knowledge they had built up over a series of lessons. Mr Ferguson (Technology) – Mr Ferguson began this lesson with some retrieval practice in the shape of an exam question. Students were given time to complete the question before going through possible answers. Mr Ferguson questioned students to depth asking them to offer answers and give reasons for their answers. He also modeled the thinking behind the approach and asked students to explain how they approached the question and came to an answer. Mr Ferguson had really high expectations of student responses and encouraged them to always a give a reason for their answer. In the lesson students had also been making use of a knowledge organiser to start assessing what they knew and what they needed to revise. Ms Campbell (History) – Year 8 students were acting on feedback from their most recent assessment – an extended piece of writing. Before students got started Ms Campbell spent some time recapping the PEE (Point Evidence Explain) method for tackling long answer questions. She did this really well by modelling a paragraph on the board and then asking students to pick out the different parts of the PEE method. Ms Campbell used questioning to challenge students to think about how this might help them with their own work. With a clear understanding of what was expected of students they were then given time to act on the feedback Ms Campbell had given them. She had used ‘code marking’ to reduce marking time and students were being trained in how to do this. Students then worked in silence to improve their work whilst Ms Campbell circulated the room to give more verbal feedback. Ms Harry (Drama) – Year 9 students were being introduced to a new topic about ‘Developing empathy.’ Ms Harry started by questioning students of the word ’empathy.’ She then followed this up by giving students the example of young homeless people to discuss: “What are the common assumptions we make?” This led to a rich discussion partly due to the choice of example planned for this discussion – something all of the students were already aware of. The talk in small groups was really purposeful and when Ms Harry got the class back together to feedback some wonderful responses were shared. Student oracy was really strong in this lesson which was down to Ms Harry’s high expectations of student language. Mrs Dixon (Maths) – Year 9 students were revisiting a topic from a previous topic and were given time to practice their skill in substituting numbers. This was great retrieval practice. Student voice suggested that students could remember the topic but were a bit ‘rusty’ when it came to application of the skill. Retrieval practice is absolutely vital for learning so it’s really encouraging so see this happening in many lessons across the academy. Whilst students were practicing Mrs Dixon was able to move around the room offering 1-to-1 feedback and further challenge. The task had been designed so that it gradually got harder as students moved from left to right. Retrieval practice from Mrs Dixon in Maths. Mrs Atkinson (Computing) – Year 8 students were engaging with some DIRT time following a recent written assessment. They had been given feedback on their assessment and were now practicing skills based on knowledge gaps identified through the assessment. The class was quietly working and being supported through additional resources and feedback from Mrs Atkinson. In order to dissolve some common misconceptions Mrs Atkinson spent time modelling the process of converting binary numbers on the board so that students could revisit the process. This then enabled a number of students to work independently through the practice materials. Modeling from Mrs Atkinson in year 8 Computing. Ms Jenkins (Science) – Year 8 students were investigating how mass effects the speed of an object falling. Ms Jenkins had used the example of aid agencies dropping food parcels into hard reach areas of the world. This example gave students a concrete starting point for understanding the concept they were learning about. Next, students built mini paper helicopters for an experiment that involved dropping the helicopters from a set height multiple times, adding more weight after each drop. Before carrying out the experiment students were asked to make a prediction as to what would happen as more weight was added. They then went out into the academy to test their predictions by dropping paper helicopters from the first floor to the ground floor. Students had been put into groups and assigned roles to carry out this experiment. As students conducted the experiment Ms Jenkins visited each group to question their method and challenge them further about their results and what the results meant. Students appeared to enjoy this practical but at the same time felt challenged by the science! Year 8 Scientists making predictions and then testing them. This weeks blogs of the week focus on deliberate practice and its essential role in facilitating learning. Practice files: A culture of practice by Harry Fletcher-Wood. Practice makes perfect but only if you practice beyond the point of perfection by Daniel T Willingham. This weeks blog of the week isn’t a blog but a video of David Weston’s recent TedX talk. In the talk David outlines the principles of great teachers by drawing parallels with great doctors and dancers. Worth 20 minutes of your time! This blog is a summary of a Practice Guide by Pashler et al. 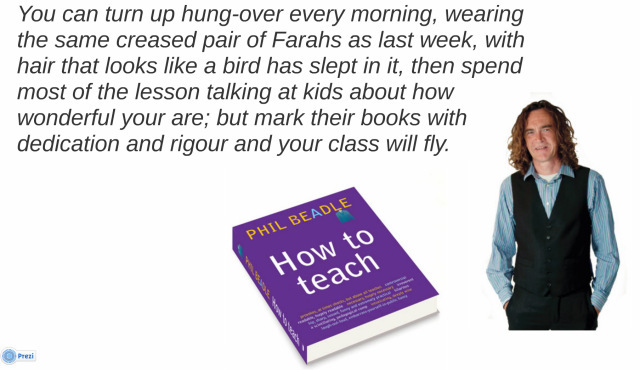 from 2007, which sets out to provide teachers with specific strategies for instruction and study. I came across it in a roundabout way via this paper by Dunlosky et al cited in the “What makes great teaching? Review of the underpinning research” by Rob Coe et al. The central tenet of this particular Practice Guide is that learning depends on memory, which can in turn be strengthened by concrete strategies. These strategies help students to master new knowledge and skills, without forgetting what they have learned. 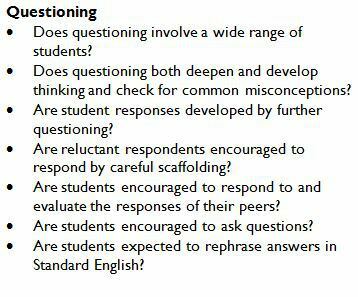 This weeks blog of the week is great reflection on effective questioning and what the purpose of questioning is. Make an effort at all times (even if you are feeling ‘crappy’). 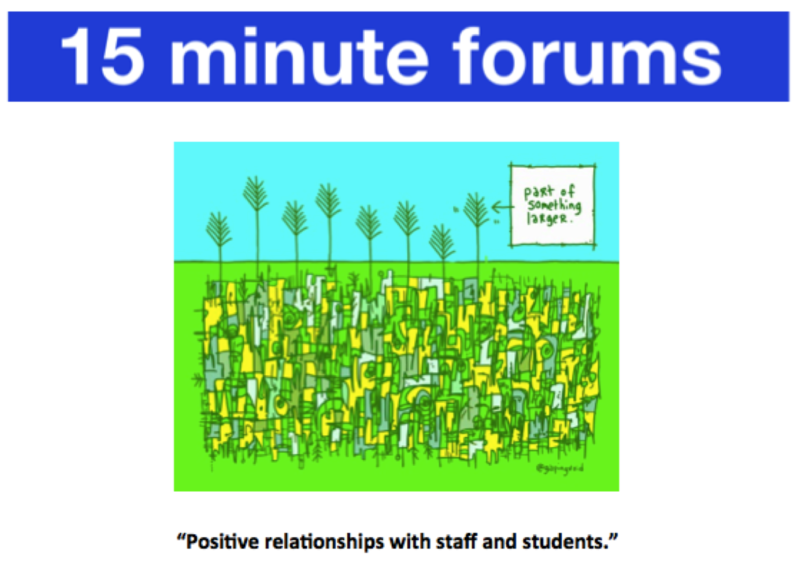 Smile and say “Hello!”, “Good morning!”, “Good day!” Even if you don’t know that member of staff or even if you don’t teach that student…it can make a difference to someone’s day. Make sure that students are aware of your expectations; be firm, be fair be consistent. Listen. Really listen. Try not to sit there thinking about what you are going to say next…you’re not really listening. Summarise what you’ve heard and clarify this with ‘informed’ questioning. Why do you think that? Where did you get that information?…..
Give someone a compliment – I really liked what you had to say in that meeting because…; I thought that proforma you produced was really good; I particularly liked…. Offer help – even if you are really busy, can you take on a small task to help a colleague? There is always someone in a worse position that you. Be positive…it will make you feel better!